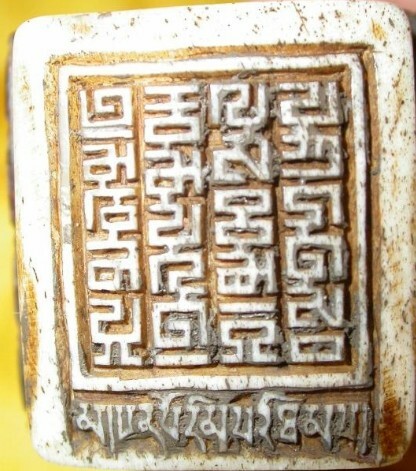 The quality of both the Phags-pa inscription and the Tibetan inscription is quite poor, and several of the letters appear to be corrupt. The Phags-pa inscription reads mkhan po --m (rim ?) pa'i las tham [kha ?] bkra shis "Seal of the Abbot ..., good luck" (I'm not quite sure what the first letter of the second column is, and the symbol at the bottom of the third column is perhaps a corruption of kha). The Tibetan text is much the same, reading mkhan po rim pa'i tham ga མཁན་པོ་རིམ་པའི་ཐམ་ག (the letters kha and ga are both corrupt). The inscription is very clear and reads thung ling shi gyaw tay 'wen guė shhi, which can be interpreted as a phonetic representation of the Chinese tongling shijiao dayuan guoshi 統領釋教大元國師, meaning "Leader of the Buddhist Faith and Imperial Preceptor of the the Great Yuan dynasty". This is a well-known title that was bestowed by Khublai Khan (reigned 1260-1294) on the Phags-pa Lama (c.1239-1280) and his successors, so if it were genuine it would be a very important historical artefact and extremely valuable. The letterforms on our seal exactly match those on the above seal imprint, but are very crudely carved, and we can only conclude that it is a poor imitation of the real thing. 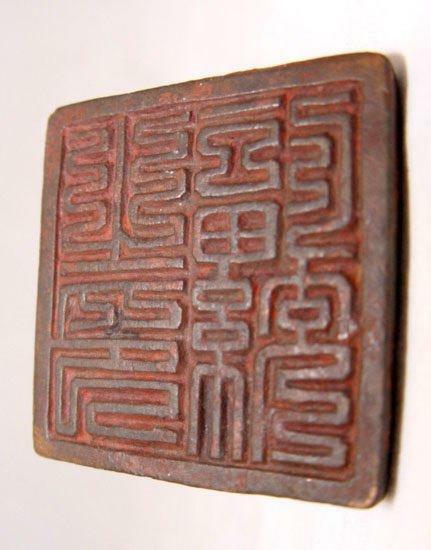 Although the above list may give the impression that this is a common seal, Jin dynasty bronze seals like this are very rare, and especially hard for the private collector to acquire. In my opinion, the price asked for this seal ($950) is very reasonable if it is genuine, and from the pictures of the seal on the seller's site it does look genuine to me. 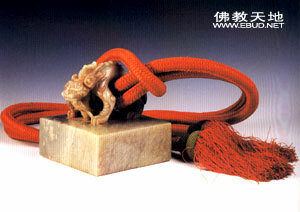 This is a good example of a Yuan dynasty personal signet seal, which were used by individuals to seal their name on documents. 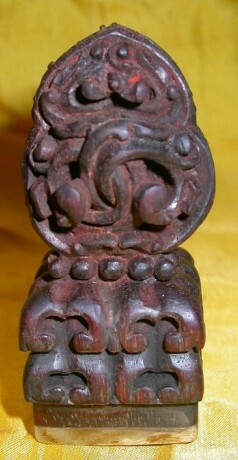 A large number of such seals are known, many of which have the name of their owner engraved in the Phags-pa script or jointly in Phags-pa letters and Chinese characters. The Phags-pa inscription on this particular example reads leung -ing, which is almost certainly a Chinese name, Long Ying (龍/隆 應/英). On the side of the seal are engraved the Chinese characters he tong 合同 "agreement", indicating that the seal was used in sealing agreements. There is no doubt in my mind that this particular seal is genuine, although I am afraid that it is seriously overpriced. Regular readers will remember that last summer I was looking at the various Zhang Zhung Scripts associated with the Tibetan Bon tradition, and in particular I was interested in the sMar chen སྨར་ཆེན style of script, for which I created a test font. One of the problems in studying these scripts is a paucity of materials written in the scripts themselves other than tables of letters that are given in various calligraphy books. 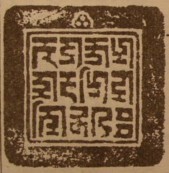 According to Tenzin Namdak this is a royal seal of the Lig-myi-rhya dynasty (Lig-mi-rgya in later sources), the last kings of the Zhang Zhung kingdom during the 7th century. The historical sources are notoriously confusing, and there is a good deal of uncertainty about the kings of Zhang Zhung—it used to be thought that Lig-myi-rhya was the name of a particular king (or perhaps more than one king), but now scholarly opinion seems to be that this is the title assumed by the Zhang Zhung kings, corresponding to Tibetan srid pa'i rje "'Lord of Life". 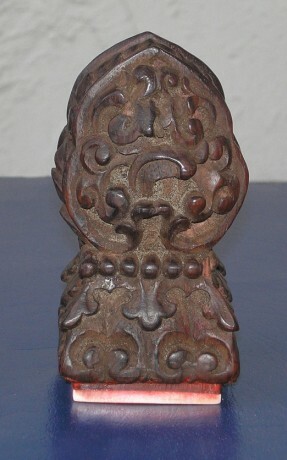 Without having even seen a picture of the actual object itself, it is difficult to make a judgement as to whether this seal does indeed date back to the time of the Zhang Zhung kingdom or whether it is the work of a later age, though even if it is a later reproduction (as the sceptical mind will no doubt suspect) it is always possible that the inscription on it may be a copy of a genuine Zhang Zhung title. "Wielding Power Over All, King of Life"
I think that it is clear that glyph 2 is ma not tsha, and glyph 9 is ci not zhi, and that Tenzin Namdak's readings of these two glyphs are either errors or deliberate corrections. The reading for glyph 10 is a little more problematic as it is not very clear from the image of the seal imprint what grapheme it is intended to represent. Nevertheless, it does seem to me that glyph 10 cannot possibly be ra, and my reading of wa (or possibly we, with an e vowel sign above a reduced letter wa) is much more plausible. As to glyph 11, I suppose a case could be made for interpreting it as rather deformed letter tsa, but I think it is simpler and more reasonable to read it as ra with a little flick-back of the final stroke. 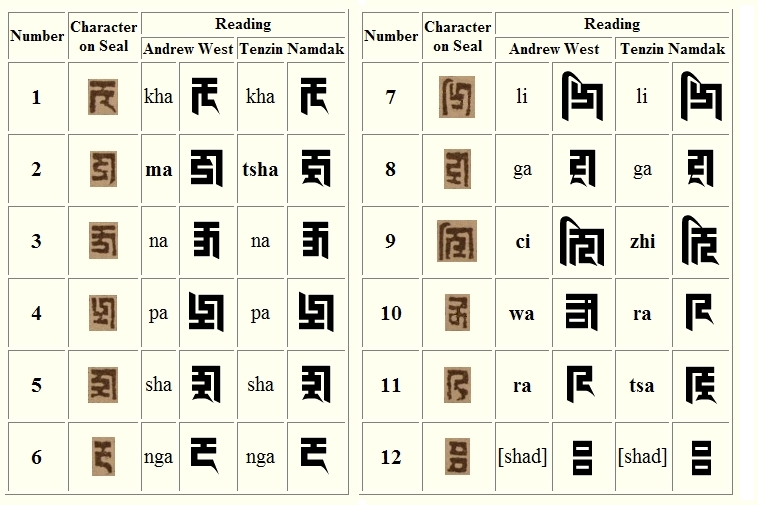 To understand why Tenzin Namdak is deliberately misreading or correcting the inscription we need to try to interpret what it means, and to do this requires a knowledge of the Zhang Zhung language that it is supposedly written in. Unfortunately our knowledge of the Zhang Zhung language is not great, being based largely on a single (not entirely) bilingual Tibetan and Zhang Zhung text, the mDzod Phug མཛོད་ཕུག, supplemented by translations of titles of Tibetan texts and various snippets preserved here and there. Luckily for us my good friend Dan Martin has made available a critical edition of the mDzod Phug, as well as a Zhangzhung Dictionary that synthesizes his own work on the mDzod Phug as well the lexicographical work of other Zhang Zhung scholars. It is Dan's dictionary (April 2004 edition) that I use as my main source for interpreting the inscription. Looking at the Zhang-zhung Dictionary, this does not seem to make any sense, and can be discounted. kham corresponds to Tibetan sog pa "shoulder-blade, scapula", and na is a "locative" particle, which I think can also be discounted. 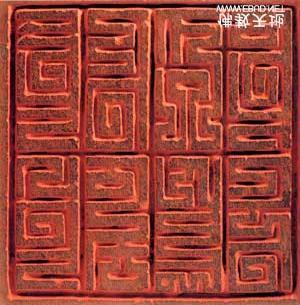 kha mar or kha mur, which corresponds to Tibetan rig pa "knowledge, understanding"
kha mun, which corresponds to Tibetan 'dod khams "the world of sensual pleasures"
In the context of the rest of the inscription, the second of these looks most promising to me. As a~u vowel alternation is quite common in the Zhang-zhung Dictionary (cf. kha mar~mur), kha man and kha mun could conceivably be variant spellings of the same word, and the result would at least make sense grammatically: "King of Life Wielding Power over the World of Sensual Pleasures". But not being a student of Bon (or Buddhism) I do not know whether this would make sense in the context of an inscription on the seal of a Zhang Zhung king. 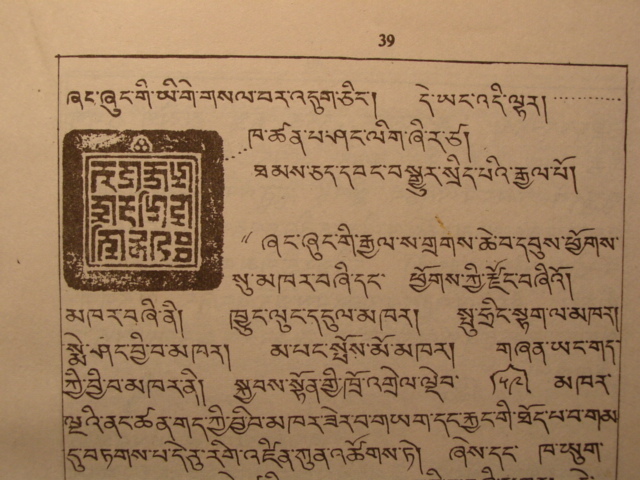 Tenzin Namdak syllabifies these three glyphs as pa shang, which corresponds to Tibetan dbang sdud "to bring under one's power" in the Zhang-zhung Dictionary, and which he translates by the Tibetan dbang bsgyur "to have power to transform, command". This seems reasonable. 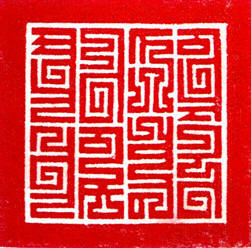 Tenzin Namdak syllabifies these three glyphs as lig zhi, corresponding to Tibetan srid pa "life, existence, world". 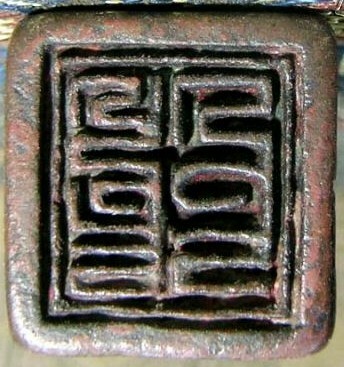 This looks very promising, except for the fact that the inscription actually has ci rather than zhi, and although there is only one stroke difference between the two letters, to correct ci to zhi would imply that the engraver of the inscription was incompetent (unlikely if it was a genuine Zhang Zhung period seal) or the seal is a fake. The other possibility is that lig ci is a variant spelling of lig zhi; although this is unattested, there are so many variant spellings of almost every word in the Zhang-zhung Dictionary that it seems quite plausible. 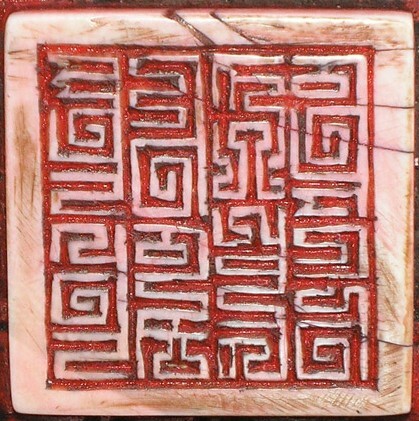 Tenzin Namdak reads these two glyphs as ra tsa, which on the face of it is unreasonable. What I think he is doing is reading glyph 10 as tsa and glyph 11 as ra, and then reversing them to get ra tsa as a loanword from Sanskrit rāja "king". This really troubles me as glyph 10 does not look anything like tsa, and reversing glyphs 10 and 11 suggests that there is something seriously wrong with the inscription. Furthermore, ra tsa (or anything similar) is not otherwise attested in Zhang Zhung text—although it is included in Siegbert Hummel's "Materialen zu einem Wörterbuch der Zan-zun-Sprache" (Monumenta Serica vol. 31 [1974-1975]), that may be on the basis of this seal (I haven't read it so I'm just guessing). I think by far the simplest explanation is to read these two glyphs as war, and assume this is a variant spelling of the common Zhang Zhung word wer, which corresponds to the Tibetan rgyal "royal", rgyal ba "victor, conqueror", rgyal po "king", rgyal mo "queen", etc. It is even possible to read it directly as wer if you take the upper part of glyph 10 to be an e vowel sign.